A saola has a snack. Teenagers volunteering at Zoo Boise are helping to try and save one of the world’s most endangered mammals. The teens are using an information booth to raise money for the Saola - a forest mammal that lives in Vietnam. The animal rocked the scientific world when, in 1992, scientists first discovered what turned out to be not just a brand new species, but a whole new genus. These antelope-type creatures have two long curing horns on their heads and white spots on their faces. They are remarkably shy and gentle, and have never been seen alive in the wild by scientists. Bill Robichaud is the coordinator of the Saola Working Group. He’s using conservation funds raised by the teens at Zoo Boise to save the animal from extinction. Robichaud says the money raised by the teenage volunteers at Zoo Boise helps pay rangers in Vietnam who remove deadly wire snares set by poachers. So far Robichaud’s Saola Working Group has removed over 150,000 snares from the Saola’s habitat. 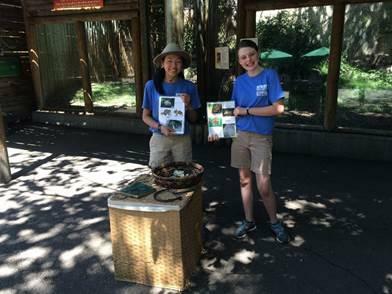 Zoo Teens at Zoo Boise, talk to patrons about the elusive Saola and how they can save it. 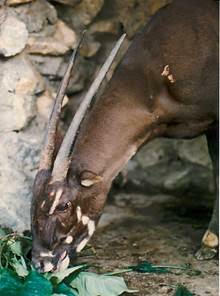 Back in Boise, Zoo Teens use some of the snares, and pictures of the Saola to educate zoo patrons about their plight. They ask for a donation of a quarter or more, because it costs 25 cents to remove a wire snare from the forest. Robichaud says he’s never seen a Saola alive in the wild. The Zoo Teen program is just one way Zoo Boise raises money for conservation. This week, the zoo says it has raised its first $2 million for wildlife conservation over the past nine years. That money goes directly to projects to save wild animals from extinction. Liz Littman said in 2007, the zoo changed its focus from just a place where people could see animals. Zoo managers wanted to make a difference in the lives of animals in the wild, many of which are struggling. “So we really want to do something bigger, so if you come to the zoo, you are doing something good, you are helping make a change and changing really why we have zoos in that we can help make sure these animals are around for generations to come," says Littman. Littman says they want to change the definition of what it means to be a zoo by conserving animals in the wild. “If you come here and have fun with your family and walk around and get to see a penguin chick, the tigers, or feed the giraffes, you’re also doing something for conservation and you’re helping support animals in the wild,” Littman says. The biggest chunk of money goes to Gorongosa National Park in Mozambique. The Zoo sends the park $200,000 each year. That helps support elephants, lions, zebras and other aspects of the park. The zoo raises a little over $250,000 every year in entrance fee revenue and donations that is sent to conservation projects all over the world. The plan is to raise $1 million every four years to help animals in the wild.